Over the last year or so, there have been a multitude of blog posts about the decline of congregational singing. I agree with many of them. Reasons given range from too many songs in the congregational repertoire, keys that are too high to sing in, songs that are difficult to sing, creating a “performance” environment, lack of musical fluency in the general public, ad-libbing by worship leaders, and loud music from worship bands. I don’t disagree with any of these reasons, as I think they all can contribute to a lack of congregational participation. I wasn’t prepared for how powerful that was going to be. If that doesn’t touch you one some level, you haven’t got a pulse! It’s just so emotional because all those thousands people who don’t know each other, are just unified by music! The song, with its secular and enigmatic text, is far from a model of an ideal congregational song. It is interesting that there are several things about the song that have been said to be inhibitors of congregational song, most prominently the difficulty of the melody and the range required to sing the song. However, those factors didn’t inhibit the crowd from singing. I believe that there were several factors that worked to overcome those obstacles. 1. The crowd knew the song. They sang the whole thing with instrumentals and parts. 2. The crowd sang it with unbridled enthusiasm. 3. The high level of participation encouraged even more participation. I can’t imagine being in the crowd and not singing. So what are the takeaways for the worship leader? 1. Make sure the congregation knows the songs in your congregational repertoire. 2. Encourage total participation, the more people who participate, the more others will want to particpate. 3. Music is a powerful tool with the power to proclaim truth and unify people. Let’s use it to inspire congregations to sing about our great God! As I’ve read my way through many of the “Why Your Congregation Doesn’t Sing” articles I’ve come to the conclusion that many of them (not all) come at the fix from the wrong angle. I’ve usually seen it from “music is too loud”, “instrumentals are distracting”, “concert atmosphere” but not many of them deal with the worship leader themselves and their attitude in worship. In every congregation I’ve been to that sings loudly and fervently, it’s because their worship leader is more so. We must realize that the congregation will sing no more than we do, they will clap no more than we do, and they will dance… probably not at all but definitely less than we do. We should start with how are we worshiping the Lord and our own hearts. Are we worshiping even more passionately and honestly than the way we expect our congregation to worship? Fantastic article. Rmembering and using the hymns many are familiar with along with the popular contemporary songs that people hear on the radio. The question then becomes, how can we best have our congregation learn new songs so that they can become excited together in singing the songs that are not as familiar. With my congregation, I have been able to find a few songs they are happy with, but many they know but do not sing out nearly as well as the ones they are extremely familiar with. I have asked many in the congregation for song suggestions and guidance in this area, but they all say they are happy with the songs currently. So I struggle to figure out how to get them to reach that point of excitement while singing. I really liked the point you made about encouraging total participation. One of the things that has struck me lately is that the congregation will almost never be more excited than you when you are leading. One of the biggest discouragers of congregational singing is a leader who is disengaged and disinterested in what is being sung. If we can lead in a way that is engaging and meaningful more people will follow and that will encourage even more people to follow. There are two practical things that I have seen to be effective for encouraging congregational singing in a church. The first one was making a playlist of songs to share with the church. I know we like to keep our songs secret to surprise people but I really think there is something great about listening to the songs ahead of time that encourages congregational singing. The second one is simply get the kids involved. Nothing encourages parents and grandparents to sing more than a child singing next to them. As Christians, we have the absolute best material to write songs with. We also have the most reason of all to sing together.There are lots of things we can do to encourage congregational singing in a church but putting God and His character on display will always be the best way to encourage congregational singing. I could not agree more, Dr. O! I’m trying to think of something of worth to add, but you made some really great points in this article. The first point of application for worship leaders, making sure that the congregation knows the repertoire, is incredibly important, though not possible at all times. If the music we use is not fresh and if we don’t sometimes use new songs, we can hinder worship as well. I think it is worth noting, then, that the way we teach songs to our congregations can be just as important as how often we introduce them. This is something that is often neglected, but it could be helpful to sing the chorus a few times with the congregation in order to teach them (and even just to acknowledge that the song is new to begin with). Another helpful tip that I’ve seen several worship leaders use recently is creating a playlist and posting it on social media for the congregation to listen to throughout the week so that when Sunday morning’s service comes, the congregation has already listened to the new song. This topic is something I have been thinking about quite a lot lately. There’s only so much you can do to encourage the congregation. “Sing it out”, among other phrases used by worship leaders, only go so far. I love the idea of creating Spotify playlists for the week of what songs we will be singing. This way, the congregants (who are tech savvy or want to know) are sort of without excuse. Maybe that last point was a bit harsh. I heasomething on YouTube from Kari Jobe, who said something to the effect that “You can’t lead where you haven’t been”. This really hits home with me, because you can’t pretend to be enthusiastic or be vulnerable in a song that talks about sin if you aren’t struggling. Just my thoughts on this. Great ideas and thanks for thee discussion! Talking about why congregations do not sing in the middle of a worship set is a hard subject. 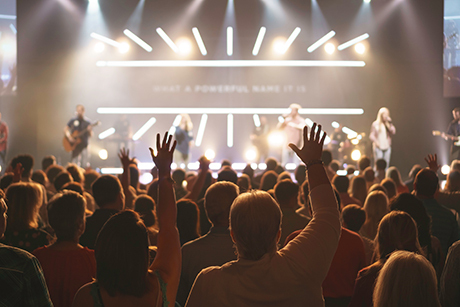 While I agree that the worship leader sets an example for how to worship and the passion they give in worship will hopefully help the congregation get involved, that is what worship leaders need to focus on first. But, their are also practical reasons that congregations do not sing along. I am blessed to be a part of a fairly musical congregation so most of the time they are singing their hearts out, but the most common thing that I have heard from people when they are not singing is that the key is to high or low for a majority of them to sing comfortably. I believe that we have to aim for keys that at least a majority of the congregation can sing comfortably it can really discourage people from singing along. That does not mean that we should always sing in an extremely lo key all the time, but we need to make the music accessible for the people in the congregation. This is very neat to see a huge number of people sing out in a concert like this. I think that we must be picking keys that people are atleast reachable by the majority of people. I think this is still the case for today because with services in the morning people are less likely to sing out as much. But, if this group of people can sing out bohemian rhapsody like this, then I think more congregational involvement is possible. Thanks for sharing Dr. O! I can say that in my congregation at home I have found that people feel the worship set can be too much of a performance and less of a time of reflection on God. Although I have been to churches here that have been more of a performance than my church at home, one moment comes to mind during a worship set around a year ago. When my church performed Oceans, they sang the bridge three times fully, before they let our electric guitarist have another full 16 measures of soloing, then another round of singing the bridge. From looking around, I could see that the congregation’s hearts were not in it. While this isn’t the leading reason the congregations don’t sing, I do believe it contributes to why they do not participate. We need to remember that worship is a time to focus on our Creator, and not over articulate on our musical abilities. To add on, it also isn’t a time to test out the new song you wrote (this hits home very much so with my pastor). Keep your focus on the God first and your congregational leading. I always found it interesting how people are unified by music. I especially appreciate the fact that, in a church, we are not only unified by a song through its melody but also through its content. In reality, a congregation should be more unified, eccentric, energized, and joyful when singing worship songs together. I completely agree with the point that congregations must know the song before a worship leader can expect them to fully appreciate it. I find it a shame, however, that congregational singing may largely be a “participation” event. I know many people are embarrassed by their singing, and so avoid it as much as possible, at least when in public. It seems as if the church has not yet completely separated itself from the world; people shouldn’t care about how they sound when they are in church. Their focus should be 100% on Christ, and what He has done for us. It can be difficult, then, to be a worship leader who is trying to lead a congregation of shy singers. I believe that the way to break out of this shell is to constantly remind the congregation of the reason they are singing. All other tools can work as well (such as the three mentioned above); however, if the congregation is not always being pointed towards God and His throne, then I believe all other efforts may be in vain. Either way, there is a remedy for this modern problem, and as always the remedy starts and ends with Jesus Christ. I absolutely have experience with this issue in my home church. When people aren’t complaining about not knowing songs, they’re complaining that songs are being used over and over and are growing old. As worship leaders, we must never turn into people-pleasers, consumed by what other people think of us. All of the complaints that bombard worship leaders on a weekly basis make them highly susceptible to such characteristics. It is truly amazing the unity that can arise from congregational worship. Unfortunately, what is musically pleasing to us doesn’t always equate authentic worship for the congregation. We must examine our intents and our hearts to make sure that God’s Glory is the reason for it all. I agree with the YouTube comment that said music unifies people. I believe music in the church forms what we believe and know to be true. Deuteronomy 31:19 (ESV) talks about when Moses wrote a song. God tells Moses “Now write down this song and teach it to the Israelites and have them sing it, so that it may be a witness for me against them.” God tells this to Moses so that when the Israelites turn from God and disasters come, this song would be remembered. I think part of our job as worship leaders is to create a congregational repertoire that allows the congregation to remember and take the words of the songs to heart. We need to encourage the congregation to sing and sing enthusiastically. When we join as a congregation to sing unto the Lord we learn truths about God and bring glory to Him. I think a good question to ask here is why they knew the song so well, why did they sing it with such enthusiasm? Because they loved what they were singing, and they loved what they were singing about. A major component of singing passionately and wholeheartedly is to be passionate about that which you are singing. Why then, do some congregations sing so well, and others not at all? We need to encourage teaching, discipleship, and personal study throughout the rest of the week, so that when the congregation arrives on Sunday, they want to sing. Our worship always starts from knowing who God is, loving who He is, and therefore responding to who He is. I think that today, people are loosing sight of congregational worship because we do not often enough practice personal musical worship. I think that there is a lack of time investment on most people’s part to practice worshiping on their own. Congregational worship is great, but private worship is also needed. After we have privately practiced worship and it comes time for congregational worship, we need to make sure that we are creating the best possible environment for people to worship TOGETHER. There are far too many “I” and “me” songs in contemporary worship music, and not enough “we” and “us” songs. Congregational worship should be a time where we glorify God as a group and lift up those around us with the words that we are singing. If you are leading congregational worship, you need to figure out what your congregation is comfortable with and capable of so that you can created an environment where they are able to sing and sing with passion.